Friday, July 1 at 10:30am. Race Starts at 11am Sharp! 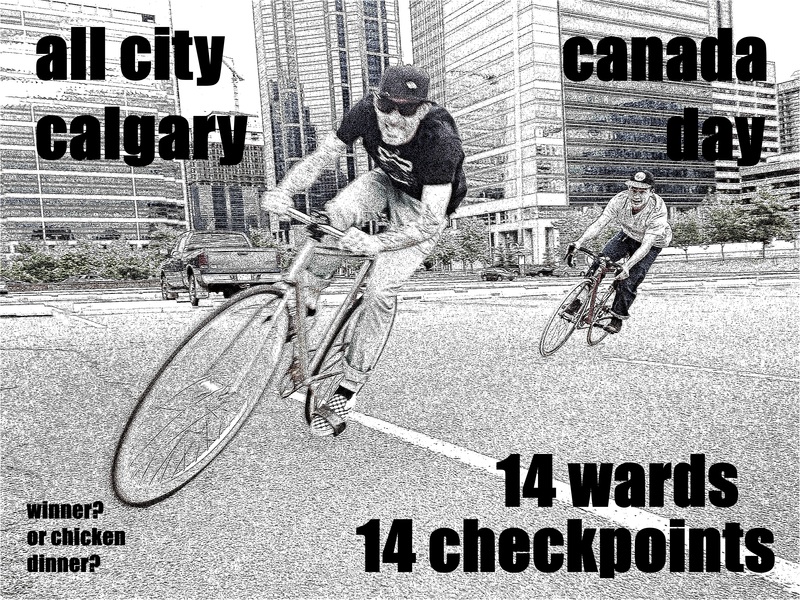 All City Calgary is a checkpoint-race covering all 14 wards in the city. You'll be given a manifest of 14 addresses that you'll have to find, take a selfie in front of the location, then return to the finish as fast as you can. $5 entry fee. Cash collected will be redistributed as draw prizes. Everyone will receive the race manifest at 11am sharp. The race will start and finish at the same place with a BBQ/Afterparty planned. There is a gas BBQ and firepit onsite. Feel free to bring anything you need for after the race and leave it while you're out on the route. Come for the race, stay for the party. You'll need a cellphone or digital camera to participate. 2. People aiming to win one of the categories ARE NOT PERMITTED to use the C-Train. We have no way of patrolling this so we're hoping honour prevails. 3. All others can use the C-Train but be aware it will be operating on Holiday level of service and may not be worth the possible wait. 4. Everyone finishing within the 4hrs time limit will be eligible to win draw prizes. If you are not present for the draw, you don't win. 5. Upon arrival at the finish, present your phone/camera to the finishing judge for confirmation you've reached each checkpoint. If your phone dies, too bad, so sad. 6. Safety and respect for others is your #1 priority. Yep down for this one! Look up fella, top right.